East Bank Football Association under-13 league when they edged Herstelling Raiders 1-0 at the Farm ground yesterday when play continued. It was predicted that the game would have been a keen contest and that’s how it unfolded. 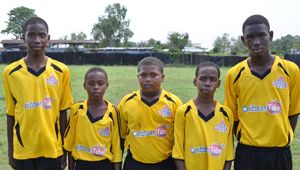 In the day’s other encounter, Agricola Red Triangle led by a double from Michael English, recorded their first points owing to a 6-0 triumph against the Linden Soesdyke Highway based Kuru Kururu Warriors. Diamond also got onto the points sheet via the walk over route since Soesdyke Falcons failed to put in an appearance. The Grove/Herstelling showdown produced some exciting action with both sides taking on each other in end to end play. The first 30 minutes failed to produce any goals. Grove would take the lead four minutes into the second half compliments of a Kevin Padmore goal. As it turned out, that was the goal that made the difference between the two teams, the result kept Grove’s unbeaten record intact after three games while it was the first blemish for the Herstelling side that remains in second place. Agricola Red Triangle, having conceded their first two games to Grove and Herstelling respectively, ensured that the momentum would change for the better with a compact 6-0 win over Kuru Kururu Warriors. Leading the young Agricola unit was Michael English who netted their first two goals; an 8th minute penalty conversion sent them on their way, English adding his second in the 16th minute. The Warriors tried their best to contain their opponents but did not succeed as two more goals were added before the halfway mark. Kerry Barker in the 27th minute and Tyron Younge in the 28th saw their side a 4-0 advantage at the half. Kuru Kururu improved their level of play in the second half and came close two scoring on a few occasions. Andre Hinds made it 5-0 for Agricola in the 45th minute while Keron Narine, a skillful left footed player sealed the deal from the penalty spot in the 55th minute with a powerful left foot shot.